Adorning your walls with art is easy when there are thousands of motifs in so many shapes and sizes. It’s even easier when the canvas print is made precisely to your measurements on aRead moren environmentally friendly canvas. Your canvas is just a click away. All you need to do is find your favourite motif, choose the size and then decide how you want the edge of the canvas to look. You can order your canvas print with or without an inner frame. The DIY inner frame is easy to assemble without tools. Everything you need for your canvas print comes in the package, including the wire for hanging. The ash wood frame is 30 mm thick. All our motifs are sorted by colour and room so you can easily find what you are looking for. You can also sort motifs according to your interests and tastes. When you’ve found your favourite motif from our wide range of canvas prints, just click to add it to your basket and check out quickly and easily from anywhere without having to create an account or log in. Once your order is placed, we’ll print your canvas print immediately and ship it within 1–2 days. Assembly instructions are included in the package. The print is of the highest quality and will not fade in sunlight. Your print will arrive in a cardboard box that is partially or entirely made from recycled materials, and you can use our 100 per cent recyclable wooden frame to hang your print on the wall. To read more about how we work to minimise our environmental impact, please download our environmental policy. It can be hard to choose just one motif for a canvas – sometimes you might rather have two, three, four or even more motifs nested together on one wall. Use a level and measuring stick to hang your canvas prints properly. Consider making a sketch before you begin hanging them. Lay out the prints on the floor if you have the space or else draw them on paper. One extra piece of advice is to have a straight line somewhere, horizontally or vertically, between the prints. This will make the wall look better organised and make it easier to mix and match motifs. 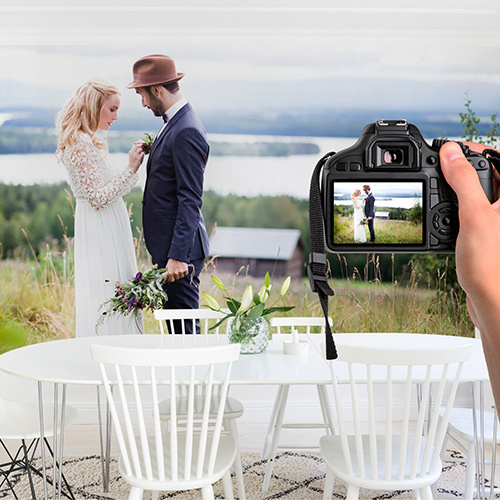 We want to help you find the perfect canvas. Our collection contains canvas prints by innovative designers, creative photographers and illustrators who have all created motifs for living rooms, kitchens, bedrooms, children’s rooms and hallways. Together they offer a range of creative expressions suitable for all styles, personalities and settings. It’s easy to change the mood of a room with a large canvas. It can also add colour to your white walls. You can experiment with images of flowers, textures or why not even a classic work of art? 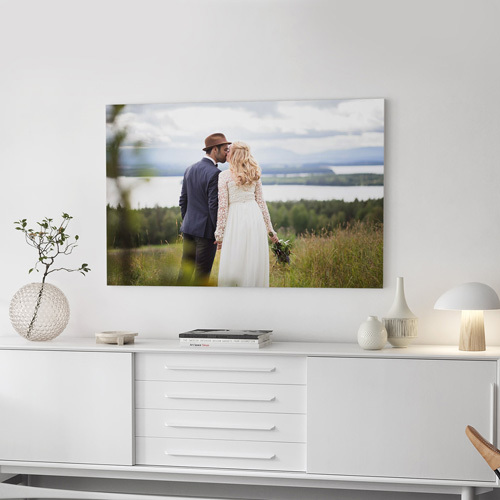 Our canvas prints come in sizes up to 150 centimeters in height and width and are delivered on a roll in a sturdy cardboard box for easy mounting on our canvas frame. Rustic stone walls, your favourite sport or images of our solar system. Rust red, ocean blue and taxicab yellow. Graphic, abstract or why not a texture? Our canvas gallery includes thousands of hand-picked motifs for you to choose from when styling your walls. Do you want to change the mood of your child’s room? With our children’s motifs, a child’s room can be cosy, playful, cute or cool – or reflect your child’s interests. Discover beloved characters from children’s films, adorable animals like cats or horses, playful circus motifs or dreamlike forests. We also have motifs featuring colourful dinosaurs, charming fairytale illustrations and hand-drawn woodlands in delicate shades. All the canvas prints for children can be ordered with or without frames and are available in many sizes. Do you want the room to evoke even more playfulness? Our best tip is to mount the print in a unique way, such as taping in the corners. Visit our magazine for more creative tips for children’s rooms.